Daughter of Oney Cypress Randal and Susannah (her full name may be “Susannah W. Wilkins”), Elizabeth M. Randal is believed to have been born on January 28, 1818, in Franklin Co., Georgia. Interestingly, because her sister Eliza B. Randal had married William G. Smith's brother, John R. Smith, this has caused considerable confusion among genealogists as some have misinterpreted “Eliza” as a shortened version of “Elizabeth”… since both women have the same married name of “Smith”. 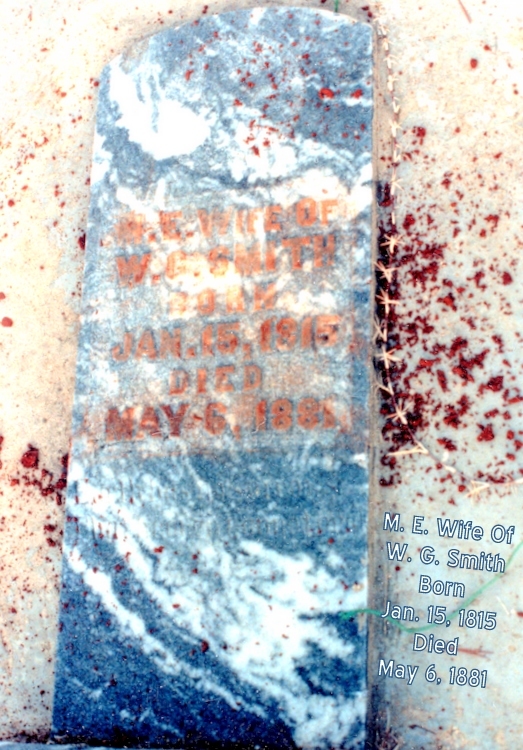 This Tombstone is believed to be that of Elizabeth M. Randal Smith, inscribed simply: “M.E., Wife of W.G. Smith, Born January 15, 1815, Died May 6, 1881”. However, if it is, then it appears to be fraught with errors.